Maya attended the Screen Awards wearing a rust orange Anavila linen sari with a houndtooth patterned blouse. Wearing her hair in a braid, she added long earrings and a grey bindi which made the look rather cute. Do I like the look? Yes. Do I think this look was better left for a more casual event? Absolutely! P.S. For the folks who are wondering who she is, Maya was most recently seen in Ankhon Dekhi. 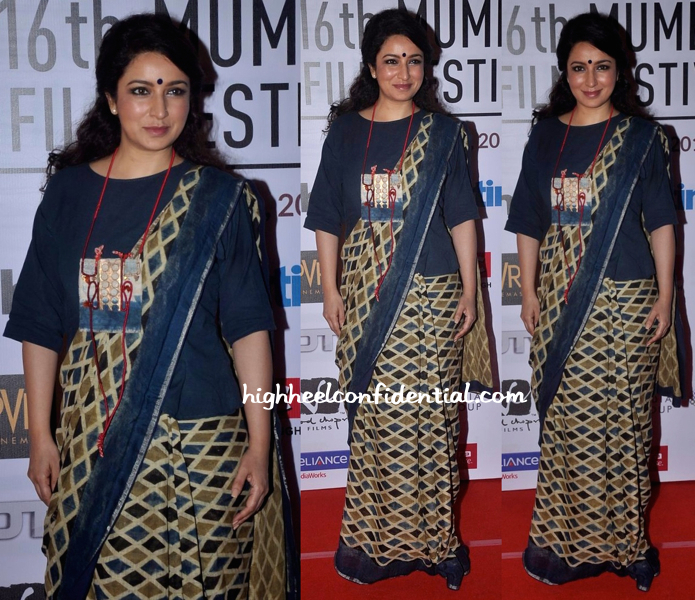 Tillotama attended the screening of ‘Children Of War’ at the ongoing IFFI wearing a linen sari by Anavila. 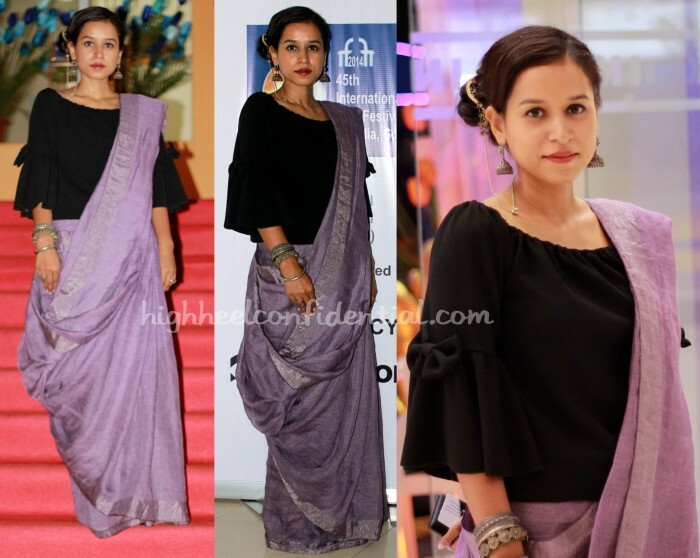 The bell sleeved blouse at first seemed to jarring against the purple sari but the more I look at it, the less I mind it. The addition of the silver jewellery and the headpiece created quite a cute look. I quite like. You? Elena Kazan, a German-Russian actor who has made Mumbai her home, recently appeared in a Filipino movie that was screened at the Tokyo International Film Festival. Considering a festival circuit normally sees folks go for the most eye-catching outfit, Elena surprised (in a good way) by opting for simple Anavila looks. I just wish the drape was just an inch higher. For Tisca, it was an Anavila sari while at a recent event. Wearing her hair half-up, she finished out the look with a big matching bindi and conceptual jewelry, also by Anavila Misra. Approve of Ms. Chopra’s departure from the same ol’, same ol’? Wearing an Anavila sari, Tisca attended an event in Mumbai on Sat pairing the plaid sari with a woven blouse also by Anavila and a gold Suhani Pittie necklace. There is no denying that she wore the sari well but in some pics the smokey eyes looked a wee bit patchy.